Stomahesive is a pectin-based protective skin barrier for ostomy that helps fill in uneven skin surfaces, increasing the wear-time of an ostomy system and protecting the skin. Skin irritation occurs when barriers leak around the stoma through gaps in the skin. Stomahesive fills in these gaps, helping to prevent leaks, maximizing wear time, and keeping the skin clean. Some of the paste tried was either to hard or runnier. This has the best consistency. I have used this product for several years and have had no problems with it ,until this year. 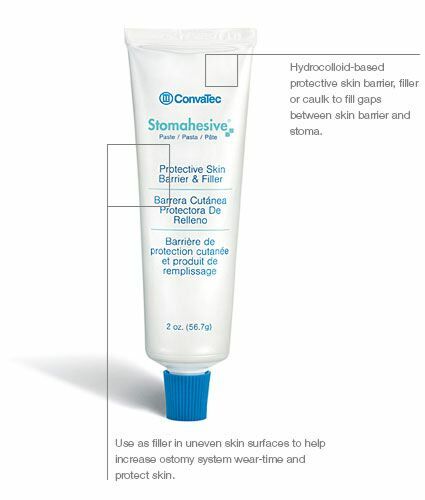 This product has been hard in the tube and doesn't squeeze onto the skin barrier. Also, when it does squeeze onto the skin barrier it doesn't adhere to the skin. This is the only paste I would use! This is sofar the best paste available. The paste melts away too quick. It should be more stomach acid resistand. I have been using this paste since I got my ileostomy in 1980. At least I am not alergic to it. All the others give me a rash. Thanks! Product holds tight. Outlasts other brands.